Imagine a billion tonnes of scorching hot gas and radiation being hurled toward you – it’s not the sort of thing you come across every day. This is actually something our Sun does on a regular basis, although fortunately for us our atmosphere stops anything too dangerous getting in and hurting us. But satellites, as well as any astronauts in space, feel the full force of a Coronal Mass Ejection (CME) – as these massive bursts from the Sun are known – and they can be really dangerous. And it’s not just about damage prevention – we’re learning loads about the Sun too like new footage from Stereo showing just how powerful solar bursts can be as they rip the tail off a comet. The Stereo probes are telling us loads of things we didn’t know about our parent star. So why are there two probes in Stereo – wouldn’t just one have been cheaper? 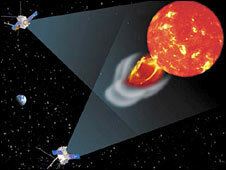 The whole point of Stereo is to give us a 3D view of the Sun – just like having two eyes a small distance apart helps our brains give depth to our vision, the two Stereo probes can give us a three-dimensional view of our Sun because one follows a path slightly in front of Earth’s orbit, and its twin trails on behind. What would happen if one of these CME’s flew straight into our planet? Something not many people realize is that the effects on our lives could actually be huge. For a start many satellites would be knocked out, meaning no television, GPS, weather forecasting and more for a few days. And then there’s cell phones, the internet, and anything else that needs satellites to work. The good news is that thanks to Stereo, we will be given a few hours’ warning if a CME is heading toward our planet, giving operators vital time to shut down any satellites in the path of the Solar blast, as well as making sure any astronauts are safely inside radiation-proof areas. The wonderful Stereo probes are yet another example of why scientific research isn’t just about proving some professor’s theory or doing some irrelevant calculations – it really could save our lives. Of course, until the day when a CME is headed our way, it’s always fascinating to discover more about our amazing Universe. Interested? Read about how radiation could prevent humans from ever going to Mars.